There are no beaten paths when your road is the Blue Danube... on an idyllic 8-day trip featuring a 7-night Vienna to Munich river cruise. Your leisurely riverboat journey unfolds like a dream: dramatic river landscapes, fairy-tale castles, Roman ruins, and romantic villages...the epicurean delights of Wachau Valley, wine tastings, a private lunch at a Cesky Krumlov castle... a mountaintop abbey drenched in lavish Baroque art... a mad count’s romantic vision of a medieval castle... the quirky, eclectic charms of Bratislava... and the magic of Vienna, capped by a sumptuous evening of dining and music at a Viennese palace. Your Danube River cruise begins at 5:30 PM in Munich. A transfer is included from Munich International Airport directly to your riverboat, where embarkation begins at 4:00 PM. Settle in aboard ship and then meet your fellow river cruisers this evening at a welcome cocktail reception followed by dinner. Your riverboat sets off for Regensburg this evening. Greet your first day on the beautiful Danube River with a choice of sightseeing excursions – one of which is a visit to historic Munich, where you'll join your local guide to visit the BMW Museum, portions of Munich's Olympic Park, Marienplatz and more. Alternatively, you can choose a guided walking tour of colourful Regensburg, where sightseeing includes the Dom (cathedral), the market, the town hall, and 12th-century Steinerne Brücke. You’ll also have a guided visit to St. Emmeram Palace, royal residence of Thurn und Taxis, the family dynasty whose fortune began in the 16th century and is the largest in Germany today. The castle, formerly a Benedictine abbey, is lush with Baroque features and frescoes, from the throne room to the ballroom and magnificent library, with displays of splendid art treasures, weaponry and fine porcelain – you can’t see it all, of course, since the family still lives here! Those who visit Munich can have lunch in town; those who stay in Regensburg return to the ship this afternoon for time at leisure; tonight, sail for Passau. Your riverboat arrives in Passau today for a choice of sightseeing in this riverside town in Germany, or an excursion to Cesky Krumlov in the Czech Republic. Once a Roman outpost at the confluence of three rivers, Passau is over 2,500 years old, a quintessential Bavarian town of pastel patrician houses, cafes, romantic cobblestone lanes and riverfront promenades, made for walking (many streets are closed to traffic). If you choose to stay in Passau, your walking tour immerses you in its storybook mix of Roman, Italian Baroque and German Gothic architecture. See St. Stephen’s Cathedral; view the hilltop fortress where Passau’s prince-bishops once resided; and peruse the 14th-century Rathaus (Town Hall). Later, if you wish, join your Tauck Director for a brisk walk to a hilltop fortress, or attend a public concert on the famous organ of St. Stephen's Cathedral, when available. 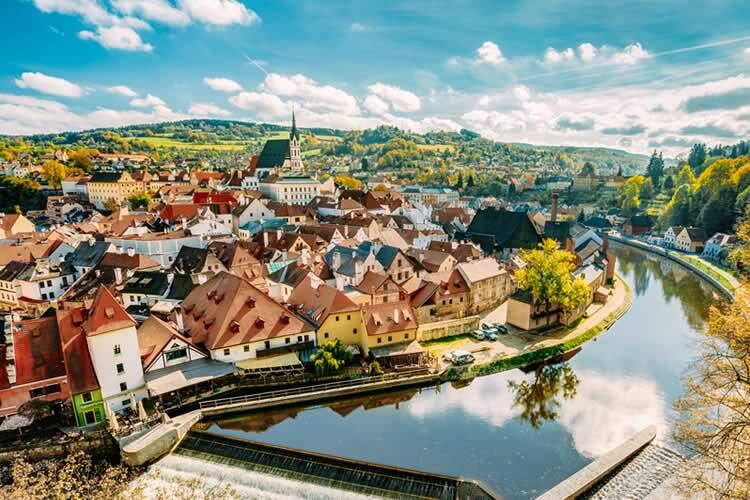 Alternatively, travel to Cesky Krumlov, an incredibly well-preserved medieval town in a landscape of exceptional beauty. Your walking tour includes Krumlov Castle, one of the largest castle complexes in Central Europe, embracing 40 buildings and palaces of medieval, Renaissance and Rococo designs, plus numerous courtyards and gardens. Return to the riverboat and enjoy the chef's signature dinner tonight as you cruise to Grein. Arrive in the typically picturesque riverside village of Grein, Austria, for a choice of sightseeing in Grein or a visit to the Mauthausen Memorial. In Grein, your visit begins with a guided walking tour of the village, which includes views of the Grein Theatre – since 1791 the oldest operating theatre in Austria – and the historic town square with the adjacent Gothic St. Giles Church, known for its fine altar and stained glass. If you wish, visit Schloss Greinburg, the privately owned castle of the Ducal House of Saxe-Coburg and Gotha, showcasing the history and lifestyle of one of the most significant ruling families in Europe (including Queen Victoria of England). Alternatively, pay a poignant guided visit to the museum and memorial on the site of the infamous World War II-era Mauthausen–Gusen concentration and slave-labor camp complex, approximately 20 kilometers east of Linz, one of the largest slave-labor camps in Nazi-controlled Europe during WWII. You’ll tour the camp’s main complex, preserved as a museum and memorial to the victims of the last major concentration camp liberated by the Allies. Back aboard the riverboat, enjoy dinner and local entertainment tonight. This morning, your riverboat docks in Dürnstein, in Austria's Wachau Valley, which offers you a choice of unforgettable sightseeing excursions. You may visit the lofty, lavish monastery at Göttweig Abbey, a mountaintop Benedictine retreat with Baroque architectural features as stunning as the views... then descend to the Tulln plain to encounter Graffenegg Castle, a 19th-century count’s madly romantic vision of a medieval castle. Or explore the picture-perfect Austrian village of Dürnstein on a guided walking tour, with free time on your own – maybe a climb up to the brooding ruins of Kuenringerburg Castle high above the town. And a third possibility is a challenging bicycling excursion (not suitable for beginners) through the Wachau Valley, starting and ending in Dürnstein. Rejoin the boat for lunch, and set off on a leisurely, breathtakingly scenic river cruise to Austria's capital, Vienna; enjoy local entertainment in the lounge after dinner tonight. You have three morning sightseeing choices today, all preceded by a tour of Vienna's landmark sights: visits to the Imperial Treasury (the Schatzkammer) in the Hofburg, displaying priceless treasures from the House of Habsburg, including the Austrian Crown Jewels and the Imperial Crown of the Holy Roman Empire; the House of Music (Haus der Musik), featuring imaginative interactive exhibits on famous composers (where you can actually “conduct” the Vienna Philharmonic); or remarkable Belvedere Palace. After lunch aboard the riverboat or in town, your afternoon is free to explore more of this amazing city – once the capital of the Habsburgs' Austro-Hungarian Empire – on your own. Later, join us this evening at Palais Pallavicini for a Tauck Exclusive – a gala evening of dining and musical performances in elegant Viennese style. The sumptuous surroundings of Palais Pallavicini (built in 1784), with its ornate decor and magnificent state rooms, will transport you to another time – in fact, the palace facade is famous in another cultural reference... as the location of Harry Lime’s (Orson Welles) apartment in the classic film The Third Man. A choice of activities await this morning in or near Bratislava, Slovakia's visually intriguing capital city. One is a walking tour of the cobblestoned, vehicle-free historic center of Bratislava; medieval, Baroque and modern architecture mix as you visit sites that include the 13th-century Old Town Hall, Baroque Habsburg-era palaces, the Opera House, Slovak Philharmonic Hall, St. Michael’s Gate, St. Martin’s Cathedral, and the Primate’s Palace, where you’ll view rare 17th-century British tapestries. Another is an excursion to the countryside, lush with vineyards, for a wine-tasting and a visit to Cerveny Kamen Castle. Dating back to the 13th century, "The Red Stone Castle" is one of the best-preserved castles in Slovakia, boasting historical furnishings and artwork; during your visit, enjoy a falconry demonstration. Prior to departure this afternoon, our local expert offers inside information and anecdotes on Bratislava. Back aboard ship, have lunch and settle in for an afternoon at leisure. Join us this evening for the Captain’s farewell reception followed by dinner and entertainment, as the riverboat heads back to Vienna for your flight home. Your Danube River cruise ends: Vienna, Austria. Fly home anytime. A transfer is included from the riverboat to Vienna International Airport and Vienna Westbahnhof.